Easy to Cook Baked Macaroni Recipe – Eats Yummy! 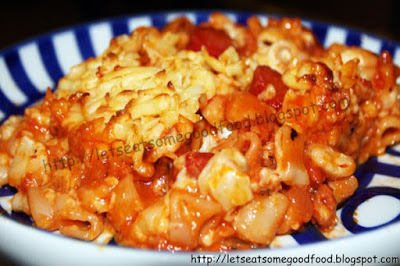 Baked Macaroni, no pasta lover won’t miss eating this particular good food dish. The flavorful taste of cheese along with beef gives a satisfying taste on your palate that will surely make you ask for more. Baked Macaroni is a little bit complicated to cook but here is an easy recipe to follow. Check out why this is one of pasta recipes that any cook wants to try cooking at home. Boil macaroni according to package directions. Drain and set Aside. Heat oil in a pan. Saute garlic and onions for few minutes. Add pepper and cook until tender. Add ground beef, ham and hotdog and cook until browned. Add tomato sauce, catsup, bay leaves and seasoning. Bring to boil then lower the heat and simmer for few minutes. If sauce gets too thick, add a little water. Add this sauce to the cooked macaroni. Mix well and transfer to an ovenproof glass dish. Set aside. In a bowl, melt butter then add flour. Stir well to remove lumps. Add milk and chicken broth while stirring continuously. Add cream of mushroom soup and cook until smooth and thick. Pour evenly over the macaroni with meat filling you set aside. Top with some grated cheese then bake in the preheated 350 degrees oven for 20-30 minutes or until the top is lightly brown. Let cool a little before serving.